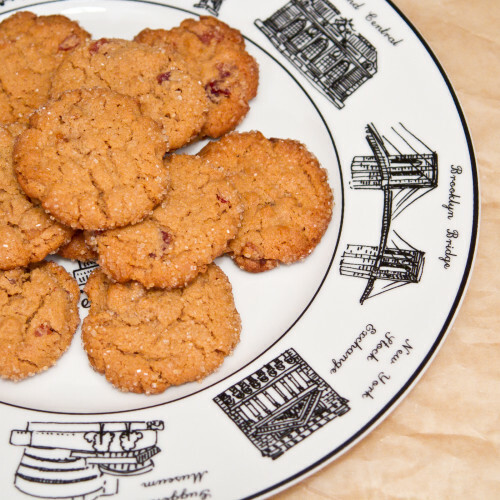 Some time ago, I came across a recipe for peanut butter and bacon cookies. I truly meant to make them but life got in the way–as well as many other fabulous recipes–and before I knew it, a year had passed without the meeting of these two unlikely lovebirds in my kitchen. Luckily, I had a hankering for candied bacon yesterday–and some extra strips that I managed to chop up and stash in the fridge before my willpower succumbed to bacon’s beckoning call. That evil little beastie! Preheat your oven to 350 degrees Fahrenheit. Line your cookie sheets with parchment paper (or use a nonstick cookie sheet). Cream the peanut butter and sugars until light and fluffy. Add the egg, beating thoroughly. Add the baking soda. 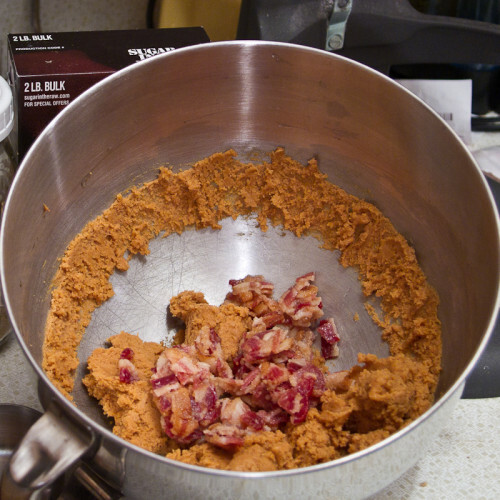 Remove from mixer and stir in the chopped candied bacon. Scoop out dough and roll between your hands into balls. Roll in the raw sugar til lightly coated, then place on cookie sheet. Press down with a fork in criss-cross pattern. Bake for 10 minutes, or until lightly browned. Let sit on cookie sheet for 1-2 minutes, then remove to wire rack to cool completely. Makes about 3 dozen, depending on the size of your balls you make them.